COVERGIRL TRUBLEND MATTE MADE FOUNDATION (D70) VS L'OREAL INFALLIABLE PRO-MATTE FOUNDATION (112 COCOA). - Pretty Mundne!!! 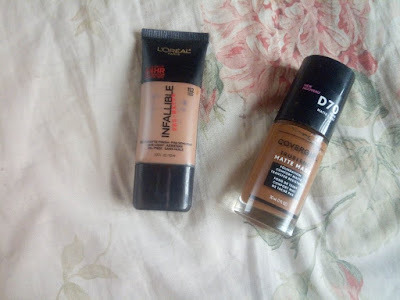 Home / Uncategories / COVERGIRL TRUBLEND MATTE MADE FOUNDATION (D70) VS L'OREAL INFALLIABLE PRO-MATTE FOUNDATION (112 COCOA). COVERGIRL TRUBLEND MATTE MADE FOUNDATION (D70) VS L'OREAL INFALLIABLE PRO-MATTE FOUNDATION (112 COCOA). When I got the infalliable foundation, I got it because I have very oily skin and the reviews I read about this foundation was amazing. I also did a review on this foundation on the blog. 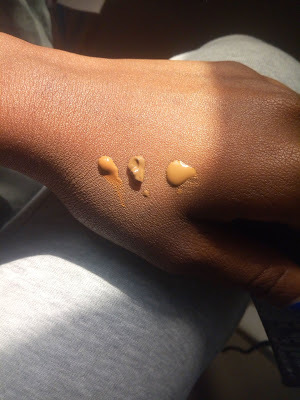 The covergirl foundation on the other hand was released last year and even though I have enough foundations I decided to try it out of curiosity. Lets jump into the similarities and differences between these two foundations. The covergirl trublend matte made foundation and the l'oreal infalliable pro matte foundation. I have been using the both of them for a long time and these are the things I noticed. They both have dispense outlets, the covergirl has a pump and the l'oreal has like a tube like outlet. 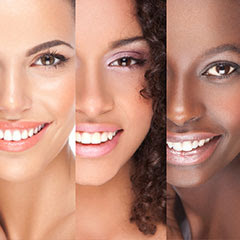 In terms of shade range the covergirl has a better shade range than the l'oreal. The cover girl has 40 shades while the l'oreal paris has just 12 shades. They are both perfect for people who are prone to pimples and breakouts. They are both oil free. The l'oreal infalliable pro matte foundation is a little more expensive than the cover girl foundation. The l'oreal infalliable foundation is $12.99 and the covergirl foundation cost about $9. They both have a thick consistency but the covergirl is thicker. The both have the same amount of coverage in my opinion but the l'oreal does look more skin like than the covergirl. My verdict is that they both do the exact same thing for me and whichever you can get your hands on please use, I will probably repurchase the covergirl instead because of the shade range and the fact that it is cheaper. What foundation do you use? Have you tried these before? THE FIRST SWATCH IS FOR THE L'OREAL AND THE SECOND IS THE COVERGIRL WHILE THE THIRD IS THE MAYBELLINE FIT ME MATTE AND PORELESS.